Synthetic peptide corresponding to Rat SCAMP5 aa 217-233. Our Abpromise guarantee covers the use of ab3432 in the following tested applications. WB Use a concentration of 2 µg/ml. 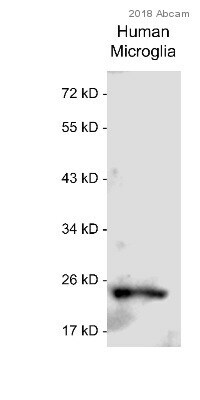 Detects a band of approximately 25 kDa.Can be blocked with SCAMP5 peptide (ab4971). Required for the calcium-dependent exocytosis of signal sequence-containing cytokines such as CCL5. Probably acts in cooperation with the SNARE machinery. May play a role in accumulation of expanded polyglutamine (polyQ) protein huntingtin (HTT) in case of endoplasmic reticulum stress by inhibiting the endocytosis pathway. Expressed both by neuronal and nonneuronal tissues. Expressed in brain, stomach, thyroid, spinal cord, lymph node, trachea, adrenal gland, bone marrow and in the different parts of brain. In thyroid tissues, it is expressed by the follicular epithelial cells. In the adrenal gland tissues it is detected in the zona fasciculate of the cortex region (at protein level). Belongs to the SCAMP family. SCAMP5 subfamily. Cell membrane. Golgi apparatus membrane. Golgi apparatus > trans-Golgi network membrane. Recycling endosome membrane. Cytoplasmic vesicle > secretory vesicle > synaptic vesicle membrane. Mainly localizes in Golgi apparatus membrane. Upon calcium-triggered exocytosis, it translocates to the cell membrane. Highly enriched in synaptic vesicles. Immunocytochemistry/ Immunofluorescence - Anti-SCAMP5 antibody (ab3432)Image from Noh J et al. J. Biol. Chem. 2009;284:11318-11325 (Fig 3A). ab3432 staining SCAMP5 in striatal neurons of R6/2 mouse by immunocytochemistry/ immunofluorescence. Cells were cultured from newborn R6/2 mice at day 2 and maintained in vitro for 3 days. Thereafter, cells were incubated with dimethyl sulfoxide (DMSO) (cells in left image) or 0.5 μm thapsigargin (cells in right image) for 24 h. Cells were grown on a coverslip coated with poly-l-lysine, fixed with 4% paraformaldehyde, and permeabilized with 0.01% Triton X-100. After blocking with 3% bovine serum albumin, the samples were incubated with primary antibody for 1 hour and fluorphore conjugated secondary antibodies. Red color stainig show positive staining with ab3432, while green color indiacates satining with antibody against ubiquitin. Publishing research using ab3432? Please let us know so that we can cite the reference in this datasheet.